patience, and the afternoon flew by. look up from this date. makes it bad amongst these wretches. Conceivably, he would have had an easier time – a war without the additional abrasions of his fellow combatants’ racism – had he been part of the Zion Mule Corps, a labour battalion of Jewish refugees who had supplied the frontlines at Gallipoli and later formed the basis of the Jewish Legion, three battalions of Jewish soldiers from Britain and America who helped defeat the Ottoman empire in Palestine. These and other stories are told in the Jewish Museum’s supple and wide-ranging new exhibition, For King and Country?, which gathers objects and images to conjure the experiences of British Jews who served in the first world war. As the show’s curator, Roz Currie, explained to me in her book-piled office, the Jewish war was both continuous with that of the rest of the British population and in certain ways sharply different, not least because of how the war changed attitudes to “aliens” and outsiders. As early anti-German feeling crested in London, East End Jewish shops with German-sounding names were attacked, and speakers of Yiddish – the eastern European language that is a dialect of German written down in Hebrew letters – were rounded on. That those Yiddish speakers were, in fact, mostly of Russian origin may have gone unrecognised by those assailants, but soon that identity would become conspicuous and contentious. Refugees from violent pogroms and desperate avoiders of the brutality of military conscription, many Russian Jews were loath to fight either with or as allies of Russia. Their low volunteering rates caused outrage in the pages of the Daily Mail where Jews were accused of lack of patriotism and of enjoying a parasitical good life (such as that might be in the slums of Stepney) while others fought and died. This changed, of course, when conscription came in and those Russian Jews started to fight alongside the Jews who had already volunteered. Ultimately, British Jews had a very high per capita rate of participation, with 41,000 serving out of a total population of only 280,000. After the war, the Association of Jewish Ex-Servicemen was formed in part to insist on the facts of the Jewish contribution, to brandish the Victoria and Military Crosses in the faces of the Mosleyite fascists and their antisemitic fantasies of Jewish wartime betrayal. Today, there are plans to establish a British Muslim army museum, perhaps for similar reasons. The British Jewish world at the outbreak of the first world war consisted of immigrants of several periods: those earliest returnees after medieval expulsion who came to Britain when Cromwell welcomed them in; some established families of the late 18th and early-19th centuries; and finally the largest group, the eastern European Jews who, while others stayed on board and headed for New York, began arriving as refugees in London and other ports in the 1880s and whose descendants form the largest part of the British Jewish community today. This community contained Socialists and Tolstoyans, Zionists, anti-Zionists, the religious – Orthodox and Reform – East End rag-trade workers, lawyers, boxers, bankers and artists. Among them all prevailed a grateful recognition that Britain was a true place of refuge, offering justice, religious freedom and the rule of law. With the outbreak of the war came the sense for many Jews that an obligation now had to be fulfilled. As one Jewish recruitment poster put it: “Since the days of Oliver Cromwell Great Britain has meted out the fairest treatment politically, socially, and in every way to Jews. Now is the time for Jews to reciprocate and show the old spirit of the Maccabees is not dead. Every able bodied unmarried Jew between 19 and 45 should join the British Army.” Among the early volunteers were a large number of members of the Jewish Lads’ Brigade, an alternative organisation to the Boy Scouts devoted to turning out similarly fearless and ever-prepared, Kiplingesque young assets to the British empire. They joined as a Pals battalion, an enterprise that allowed whole villages or groups of friends (for example all the players of Leyton Orient), to join and stay together. Five hundred were killed. In 1916, conscription was instituted and with it calls for the creation of a specifically Jewish legion intensified. These were led by two Zionists, Chaim Weizmann and Ze’ev Jabotinsky, who rebelled against the officially neutral position of the World Zionist Congress. Both wanted Jews to have a part in fighting the Ottomans in Palestine with the hope of gaining a stake in the post-war peace there. Weizmann was born in Belarus. By the outbreak of the war, he was a British citizen and senior lecturer in chemistry at the University of Manchester and a leader of the British Zionist movement. It was his scientific work that brought him into a position of influence. He invented a method of industrial fermentation that could create large quantities of acetone, an essential ingredient in the production of cordite for explosives. First Lord of the Admiralty, Winston Churchill and minister of munitions, David Lloyd George both worked with Weizmann to make this a reality on a large scale. As a result, Weizmann’s contribution to the allied war effort was enormous and during this time he had the somewhat sympathetic ear of senior cabinet ministers. of any practical value in after life. Patterson led the “Judeans” to battle honours against the Ottomans at Megiddo and Nablus, in the teeth of what he perceived to be antisemitic treatment from the wider British army. For example, the legion was posted far longer than any other unit in the Jordan Valley, resulting in 80% malaria rates. Supplies were always slow to arrive and officers enjoyed throwing antisemitic insults around. This infuriated Patterson, a devoted commander who was proud of the fighting fitness of his troops. Meanwhile, Patterson was surprised to find among the men strong differences of opinion about Zionism. The army had allowed the enlistment of passionately Zionist American Jews who gave up their nationality to do so, but a significant number of the British Jews had little sympathy for the project of settlement. For them, the Jewish Legion meant simply the opportunity to serve among sympathetic people. Rosenberg was killed at Arras in 1918, hoping that his transfer request to the Jewish Legion had been granted. His last surviving letter – written rapidly in the brief light of a stub of candle he had found – speaks of his urge to write a battle hymn for the Jewish Legion, “but I can think of nothing strong and wonderful enough yet”. Admired by Pound and described by TS Eliot as the “most extraordinary” of the first world war poets, Rosenberg’s best-known poems, “Louse Hunting”, “Break of Day in the Trenches”, “Dead Man’s Dump”, are canonical works in this most poetry-rich of conflicts. His death at 27 has been mourned by Geoffrey Hill as one of poetry’s “most severe losses”. An East End boy who had imbibed the English literary tradition at London’s Whitechapel Library, an institution that had become known as “the university of the ghetto”, Rosenberg was part of an extraordinary artistic flourishing among Jewish immigrants. To pursue his painting, he enrolled in the Slade and found himself among a gilded generation. Other students included Stanley Spencer, CRW Nevinson, Paul Nash, Dora Carrington and Rosenberg’s fellow Jews, David Bomberg and Mark Gertler. Rosenberg enlisted because of a poverty that finally overwhelmed his moral judgment that war was no solution to anything, a view inherited from his parents: “My people are Tolstoyans and object to my being in khaki.” Gertler, too, was a “passivist”, as he put it, and opposed to the war’s “wretched sordid Butchery”. This perception took artistic shape in The Merry-Go-Round, one of the masterpieces of British modernist painting. DH Lawrence, in a letter of September 1915, described a scene on Hampstead Heath that may well have provided the inspiration for the picture. true. But it is horrible and terrifying. Strangely, when the painting was exhibited, critics failed to make the connection with war and militarism. They saw the machine age. They saw something so new and shocking it didn’t make sense: “The Man Who Has Painted A Noise” shouted one headline. For King and Country? restores the sense and context to Gertler’s wartime masterpiece just as it does to many individuals’ forgotten stories. I read it fairly often and enjoy the variety of news and entertainment content. It never occurred to me that you wanted contributions, but I’d like you to stick around. Sometimes you actually have to pay for stuff you like. Go figure. For other Jewish regiments, see Jewish Legion (disambiguation). The Jewish Infantry Brigade Group, more commonly known as the Jewish Brigade Group or Jewish Brigade, was a military formation of the British Army composed of Jews from the Yishuv in Mandatory Palestine commanded by British-Jewish officers that served in Europe during World War II. The brigade was formed in late 1944, and its personnel fought the Germans in Italy. After the war, some of them assisted Holocaust survivors to emigrate illegally to Mandatory Palestine as part of Aliyah Bet. After World War I, the British Empire and the French empire replaced the Ottoman Empire as the pre-eminent powers in the Middle East. This change brought closer the Zionist movement’s goal of creating a Jewish state. During the war, the British government issued the Balfour Declaration of 1917, indicating that government’s support for the creation of a Jewish homeland in Palestine, which signified the first official support for Zionism’s aims and led to a surge of Jewish emigration in 1918–1921, known as the “Third Aliyah“. The League of Nations incorporated the Declaration in the British Mandate for Palestine in 1922. Jewish immigration continued through the 1920s and 1930s, and the Jewish population expanded by over 400,000 before the beginning of the Second World War. Brigadier Ernest Benjamin, commander of the Jewish Brigade, inspects the 2nd Battalion in Palestine, October 1944. Chaim Weizmann, the President of the World Zionist Organization, offered the British government full cooperation of the Jewish community in Mandatory Palestine. Weizmann sought to establish an identifiably Jewish fighting formation (under a Jewish flag) under the auspices of the British Army. His request for a separate formation was rejected, but many Jews in Mandatory Palestine wanted to fight the Nazis and joined the British Army. Some of these were formed into separate Jewish companies in their battalions. There was a Jewish battalion attached to the British Army’s East Kent Regiment stationed in Mandatory Palestine. 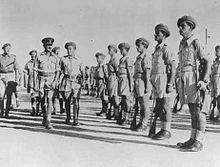 In all, fifteen Palestinian Jewish battalions were formed in the British Army in September 1940, and fought in the Greek campaign of 1941. But there was no designated all-Jewish formation. Jewish groups petitioned the British government to create such a force, but the British refused. At that time, the White Paper was in effect, limiting Jewish immigration and land purchases. After much hesitation, on July 3, 1944, the British government consented to the establishment of a Jewish Brigade with hand-picked Jewish and also non-Jewish senior officers. 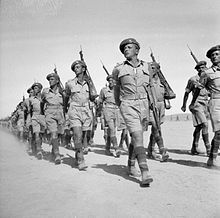 On 20 September 1944 an official communique by the War Office announced the formation of the Jewish Brigade Group of the British Army and the Jewish Brigade Group headquarters was established in Egypt at the end of September 1944 (the formation was styled a brigade group because of the inclusion under command of an artillery regiment). The Zionist flag was officially approved as its standard. It included more than 5,000 Jewish volunteers from Mandatory Palestine organized into three infantry battalions of the Palestine Regiment and several supporting units.